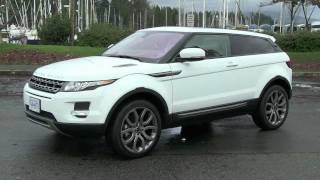 Unveiled at the 2011 Geneva Auto Show earlier this year, the all-new Range Rover Evoque is the smallest, lightest, most fuel efficient Range Rover ever produced. Evoque's potential buyers have a variety of color options (12 colors), three contrasting roof colors and feature combinations to choose from; thereby giving a personal touch for their new car! Powered by the state-of-the-art new direct injection turbocharged 240PS, 2.0L Si4 petrol engine, the Evoque accelerates from 0 to 60mph in 7.1 seconds. 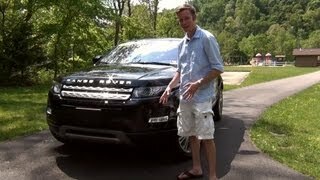 The pricing for the Range Rover Evoque 2012 is expected to start from £30,000. Geneva, 1 March 2011 - The exciting all-new Range Rover Evoque - the smallest, lightest, most fuel efficient Range Rover ever produced - brings its stylish personalisation options to life at the 2011 Geneva Motor Show. The coupé and 5-Door models on display highlight the Range Rover Evoque's vast array of personalisation options, which gives every customer the opportunity to tailor their Evoque to suit their lifestyle. A huge number of colour and feature combinations are available, such as contrasting roof colours and beautifully crafted designer interiors. As the Evoque gears up for its sales launch, there is a growing buzz amongst prospective buyers who have been seduced by the car's bold and radical approach. Much of this awareness stems from Range Rover's 'Pulse of the City' campaign, which links a worldwide audience via a series of interactive events and social media activities. The campaign features contributions from over 40 'City Shapers', leading influencers from fashion, design, music and film, who are based in major cities around the globe. "The all-new Range Rover Evoque has received an overwhelming reception following its public debuts in Paris and Los Angeles," said Land Rover's global brand director John Edwards. "Many prospective buyers are customers who have not considered Land Rover before, and yet are excited by the unique design, premium technologies and compact size that the Evoque offers." Customers can tailor their Range Rover Evoque with a tempting array of design, trim and technology options, so that each car meets its customer's own taste and lifestyle. The choices range from designer exterior packs, contrasting colours on the roof and spoilers, immaculately-trimmed designer interiors, and a range of desirable technologies to maximise comfort and enjoyment on board. Gerry McGovern, Land Rover design director said: "Customers like to make their own unique statement with a vehicle and we have provided individuals with lots of opportunity to personalise their new Range Rover Evoque, whilst maintaining the essence of the design. "The options on offer are spectacular and customers can use our 'designers choice' to guide their selection, with carefully co-ordinated colour and material combinations that have their own distinctive character," he added. Uniquely in the compact SUV segment, the Range Rover Evoque allows customers to specify a lavishly appointed cabin, with soft, premium leather and beautifully tailored, twin-needle stitching providing a luxurious finish to almost every surface of the instrument panel, doors and seats. Rather than using a traditional trim hierarchy, the Range Rover Evoque gives customers the choice of three design themes: the cool and contemporary 'Pure', the luxurious 'Prestige', and the bold and sporting 'Dynamic'. Customers can further tailor these themes with different designer interiors, option packs, standalone and accessory items, providing even more freedom to specify the car of their choice. To complement these items there is a vast range of comfort and convenience technologies to choose from, such as the sensational 825W Meridian surround sound system, the innovative Dual-View touchscreen display, TV, rear seat entertainment, an advanced Park Assist automated parking system and powered tailgate. Owners can also choose from a very broad selection of official Range Rover accessories. The accessory range includes exterior and interior styling, together with a comprehensive choice of practical loading and towing items. Most of the items were developed specially for the Range Rover Evoque, from bright side protection sill tubes and sports pedals, to roof-mounted carrier systems and a full towing kit, including tow hitch mounted bicycle carriers. Versatile luggage stowage systems are made possible with the addition of loadspace stowage rails. A strap with an Inertia locking reel, which works in a similar way to a seat belt, is one feature which prevents movement of items in the luggage area. The clever packaging of the interior of the Range Rover Evoque adds further space and versatility to the luxurious cabin. Family users will find the car provides the flexibility and luggage space of a compact station wagon. Carefully designed stowage areas under the load floor add extra capacity, while loadspace stowage rails help to secure contents in the luggage compartment. The 5-Door offers 60/40 folding rear seat squabs which allows the luggage capacity to be expanded, with a substantial volume of 1445 litres available with the rear seats folded. A full-sized fixed glass panoramic roof enhances the sensation of space and comfort in both the coupé and 5-Door, providing a superb uninterrupted vista for all occupants and flooding the interior with natural light. Land Rover engineers have developed the Range Rover Evoque to provide customers with a polished driving experience that combines dynamic and sporty handling with responsive, effortless performance and refinement. The car can be specified with the sophisticated Adaptive Dynamics system which uses advanced MagneRide™ dampers to provide a particularly good balance of confident, nimble handling and supple, controlled ride. Murray Dietsch, director of Land Rover programmes, said: "We have focused on ensuring that the car is agile and fun to drive, so that customers have a rewarding experience, even in day-to-day urban driving. Advanced technologies such as MagneRide™ mean we can ensure that this dynamic prowess does not come at the cost of top-quality refinement or comfort." As a true Range Rover, the Evoque delivers the all-weather, all-surface capability that is a hallmark of the Land Rover brand, enhanced by the latest version of the company's signature Terrain ResponseTM system. Drivers who take their Range Rover Evoque off-road will be reassured to know that in addition to generous ground clearance, the car has a significantly better breakover angle, approach angle and departure angle than other premium compact SUVs. The Evoque will be the first Range Rover to offer customers a choice between the standard, full-time, intelligent, four-wheel-drive system, which delivers outstanding performance and traction on all surfaces, and a low-carbon, front-wheel-drive option for further enhanced fuel economy. The Range Rover Evoque offers a smooth and responsive turbocharged powertrain line-up with the choice of state-of-the-art diesel or petrol engines. The comprehensively updated 2.2-litre turbodiesel has 190PS or 150PS derivatives. The front-wheel-drive coupé version combined with the 150PS 2.2-litre engine achieves sub 130g/km* CO2. The state-of-the-art new 240PS, 2.0-litre Si4 petrol engine combines direct fuel injection, turbocharging and twin variable valve timing for exceptional driveability and fuel efficiency, delivering 0-60 mph in 7.1 seconds*. With its compact footprint and advanced technologies, the Range Rover Evoque reinforces Land Rover's commitment to environmental sustainability. Lightweight construction techniques and the addition of a front-wheel drive variant ensure optimum efficiency is achieved. A new range of state-of-the-art diesel and petrol engines comes with direct injection and stop start (diesel manual only). The Evoque also adopts low CO2 systems such as Electric Power-Assisted Steering (EPAS) and is built to maximise end of life recyclability. The result is a Range Rover that sets new standards in the premium compact SUV segment for fuel economy and CO2 emissions, with the front-wheel-drive diesel coupé model capable of an exceptional sub 130g/km* CO2. Land Rover designers and engineers have developed a host of distinctive and innovative features, to ensure the Range Rover Evoque stands out from the crowd. The Range Rover Evoque is available with xenon headlamps where first to catch the eye is the powerful signature graphic in the front running lights, created by innovative LED light-blade technology. A similar graphic is repeated in the LED rear lights, with their jewel-like 3D petal design. Approach the car at night and you will also see a bold Range Rover graphic alongside the front doors, illuminated by the 'puddle lights' that shine from the mirrors. More special touches greet you when you enter the car. The interior displays come to life with a choreographed animated start-up sequence, while the rotary auto shifter completes the 'greeting' as it rises silently into the driver's hand. LED ambient lighting provides sophisticated and precise illumination within the cabin; select Dynamic mode, and a sporting red colour scheme fills the interior as well as the instrument dials and cluster display. The Evoque benefits from the same comprehensive selection of the latest technologies as the largerRange Rovers, in terms of controls, connectivity, comfort and convenience for all occupants. At the heart of the control system is Range Rover's much-acclaimed, 8-inch, high-definition touch-screen display with its crisp graphics and simple, intuitive menu structure. The display is available with the innovative dual-view technology, so that driver and passenger can view completely independent content. Tech-savvy customers get the connectivity they demand with a comprehensive package that includes Bluetooth hands-free mobile phone use and audio streaming, plus a range of USB and auxiliary inputs for iPods and other portable devices. The Evoque is the first Range Rover to offer breathtaking new sound systems developed in partnership with the high-end audio specialist Meridian. The premium Meridian offering is an 825W, 17-speaker system that delivers the ultimate in surround-sound performance. With the Range Rover Evoque on schedule for its sales launch, there is mounting anticipation among a global audience about this exciting new car. Range Rover is supporting the launch with an innovative campaign centred on the Pulse of the City. This project involves participants worldwide collaborating together through social media and interactive on-line activities to celebrate the life of major cities around the globe. "The Range Rover Evoque is ideally suited to urban driving, with its agile handling, compact size and green performance, and it's fitting that our Pulse of the City campaign is focused on capturing the spirit of city life," said John Edwards, Land Rover's global brand director. "The campaign has already generated a huge buzz around the launch of the car, and we look forward to many more people taking part and contributing to the pulse of their city," he added. The Pulse of the City campaign features contributions from over 40 'City Shapers', leading influencers from fashion, design, music and film, who have helped shape the cities they live in. During the launch period, these global 'City Shapers' will have their journeys tracked around their favourite cities. The routes will be posted on helloevoque.com, along with comments about the journey, to create a living interactive guide to their local urban environment. Using a free Pulse of the City app - available for iPhones and android devices - individuals are invited to add to the conversation by recording and posting their own journeys. The Grammy Award winning Los Angeles based rock band OK Go were among the first City Shapers to record a journey, setting off on an 8-mile musical parade in the streets of LA which spelt out the words OK Go. As the Pulse of the City grows, Range Rover will be asking its City Shapers and users of the app more about their connection to their city, with responses building an evolving portrait of each urban landscape. Each City Shaper will also be personalising a Range Rover Evoque to suit their own personal tastes, and using the car as part of their local city lifestyle. As part of the launch, spectacular wireframe sculptures of the Range Rover Evoque have been used to introduce the car to consumers in a variety of prestigious city locations. The first 10 sculptures - including four which were transformed into art installations by well-known Parisian artists - were displayed in the French capital to celebrate the car's global unveiling at the Paris Motor Show. Four of these were transformed into unique street art installations by the well-known Parisian artists André (AKA Monsieur A), JCDC, Surface To Air and Yorgo Touplas and focused on themes of luxury, design, sustainability and technology, to represent key aspects of the car. A total of 40 Evoque-inspired wireframes have since been creating a buzz in places as diverse as Sydney Opera House, Milan Fashion Week, Santa Monica Beach in California, Edinburgh Castle, Solyanka State Gallery in Moscow, and Sao Paulo Fashion Week in Brazil. The travels of the wireframe Evoques has been documented by Range Rover on local social media sites and blogs accompanied by stunning imagery of the sculptures. A smaller, greener Range Rover, the Evoque has turned the groundbreaking Land Rover LRX concept car into reality, faithfully capturing the spirit of its landmark cross-coupé design. The Range Rover Evoque is available in two distinctive versions: the stunning coupé model, which precisely mirrors the concept car design, and the stylish 5-Door, which adopts a slightly higher rear roofline for extra practicality and greater family appeal. Both coupé and 5-Door Evoque models stay true to the core values of the Range Rover brand, providing premium levels of craftsmanship, luxury, performance and renowned Land Rover all-terrain capability, but in a more compact package. The Range Rover Evoque will be manufactured at Land Rover's multi award-winning Halewood plant in Merseyside, UK. The car will go on sale in more than 160 countries worldwide from summer 2011. Prices will start from £30,000. John Edwards, Land Rover's global brand director said: "The Range Rover Evoque remains true to the brand's core values of premium luxury and formidable all-terrain performance and combines them with dynamic and sporty handling. The stunning coupé and 5-Door models offer unprecedented customer choice, broadening the appeal of this exciting new addition to the marque." The all-new Range Rover Evoque has turned the LRX concept into reality, marking a bold evolution of Range Rover design, and providing customers with a compact, premium and highly desirable SUV. A groundbreaking and original cross-coupé, the Range Rover Evoque captures - almost to the millimetre - the stunning design of the LRX concept. With its cutting edge lines and sporty, dynamic profile, the Range Rover Evoque creates a new segment for a premium off-road coupé. Gerry McGovern, Land Rover design director said: "Both the coupé and the 5-Door Range Rover Evoque share the same strong emotional appeal, capturing the unique and exciting spirit of the LRX concept." The Evoque's bold exterior features exciting new interpretations of classic Range Rover design cues, including the signature clamshell bonnet, the floating roof and the solid 'wheel-at-each-corner' stance. Unlike any previous Range Rover, the Evoque adopts a very dynamic profile with its dramatic rising beltline, a muscular shoulder running the length of the car, and a distinctive taper to the floating roofline. The bold design graphic created by the exaggerated wedge of the window line is emphasised by the black pillars. Pushing the wheels out to the four corners helps give the car its purposeful stance; the wheelarches are wide, but softly integrated into the body. The carefully sculpted corners dramatically reduce the car's visual overhangs front and rear. The front-end design makes a powerful statement of Range Rover's identity with the bold horizontal graphic created by the perforated two-bar grille and distinctive headlamps. The stylish body exudes a strong sense of premium quality with its precise, tight shut-lines and striking details like the bonnet vents and side vents. The Range Rover Evoque is available with xenon headlamps providing a jewel-like quality to the slim front and rear lamps with their LED signature lighting and tapering blade indicator clusters. The design of the Range Rover Evoque 5-Door was closely derived from the coupé model, and the two versions have identical overall length and width. To provide additional interior space, the angle of the rear roofline has been subtly revised, and the 5-Door measures 30mm higher than the coupé bodystyle. "The unique design of the Evoque will attract a new generation of Range Rover customers who have never considered an SUV before, such as premium coupé buyers who would like to make a bold new statement," added McGovern. The Evoque's interior takes the strong, clean architecture and premium quality materials of a traditional Range Rover, and applies them in a more contemporary and sporting fashion. As in larger Range Rovers, the centrepiece of the cabin is the bold intersection between the solid horizontal elements of the instrument panel and the powerful vertical lines of the centre console. Designers have also taken inspiration from the stylish forms of the LRX concept interior, capturing the dramatic slope of the centre console and the pure, elegant lines of the instrument panel. The design retains the concept's distinctive stowage area beneath the sloping console, the open structure echoing the themes of lightness and efficiency found elsewhere in the car. The exquisite quality and craftsmanship of the materials is highlighted by the very contemporary, clean treatment of the interior surfaces, including the flush treatment of the air vents and horizontal roller shutter in the centre console. Housed under a compact curved binnacle, the instrument cluster enhances the sporting, premium feel of the interior. The twin dials have an expressive three dimensional form with chunky illuminated chaplets and needles, and are set deep in sporty circular housings finished with bright chrome rims. An optional full glass fixed panoramic roof enhances the sense of room and freedom within the deceptively spacious cabin, flooding the interior with natural light. Gerry McGovern explained: "The luxurious, contemporary feel to the cabin is the perfect complement to the concept car exterior. The exquisite materials and craftsmanship, and the pure, elegant design, tell you that this is a true Range Rover interior, but one with a more sporting flavour." 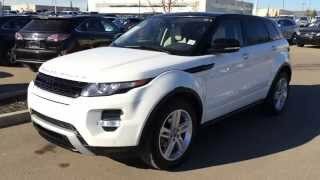 The Evoque delivers Range Rover levels of quality and craftsmanship in every detail of the car. Particular attention has been given to selecting only the best, premium quality materials, and applying those materials with impeccable taste and care. Perhaps the most visible example is the luxurious wrapped finish of the upper instrument panel. High series models use premium Oxford leather - beautifully soft high-grade hides which have been hand-picked for their exceptional touch and appearance - impeccably hand-finished with twin-needle stitching. The fascia mid-section is also leather wrapped; this, together with the lavish leather trim on the door panels and seats, creates the ultimate luxury ambience. In total, over 10m2 of leather - equivalent to more than three full hides - is required to complete each vehicle. Every aspect of the stitching, even down to the size and shape of the needle, is also specified by Range Rover experts, to guarantee an immaculate finish, every time. Even on models where leather is not specified, the instrument panel is still wrapped with a premium quality, soft-touch textured material with twin-needle stitching, for a sumptuous interior experience. In bold contrast to the opulent leather and soft-touch surfaces, strong visual highlights are provided by authentic metal finishers on the horizontal strip on the fascia, the surrounds to the vent controls, and the striking curved elements each side of the centre console. Cold to the touch and exquisitely crafted, the metal finishers are a tactile and visual reminder of the superior interior quality. The fastidious attention to detail in every facet of the Range Rover Evoque's construction can also be illustrated by the thousands of man hours spent finessing the way that all visible parts fit together, ensuring an impeccable quality and consistency of finish. The Range Rover Evoque is completely faithful to the style of the stunning LRX Concept, capturing its design almost to the millimetre. The vehicle package successfully provides a unique blend of coupé styling and capable off-road geometry and ground clearance. The interior offers excellent accommodation for passengers and their luggage, while retaining the core elements of the classic Range Rover Command Driving Position. Gerry McGovern said: "The Range Rover Evoque really does give you the best of both worlds - concept car looks combined with day-to-day comfort and practicality. From its deceptively spacious cabin to its deep, accommodating trunk, this is a car which is ideally suited to our customers' busy and active lifestyles." Sitting slightly lower than in one of the larger Range Rovers, the driver adopts a Sports Command Driving Position, which offers a more sporting feel but retains the important sensation of control and command. With its higher rear roofline, the Range Rover Evoque 5-Door adds further space and versatility to the luxurious cabin. Family users will find the car provides the flexibility and luggage space of a compact station wagon. The rear seats offer comfortable accommodation for three passengers, with each seating position having its own three-point safety belt and head restraint. In addition to generous headroom which compares very favourably to traditional sporting saloons, rear seat occupants also benefit from over 50mm more shoulder room than the coupé model. The increased window area of the 5-Door bodystyle heightens the feeling of light and space in the rear cabin. This sensation can be further enhanced by the full-sized glass panoramic roof, which provides a superb uninterrupted vista and offers even greater headroom for all occupants. Carefully designed stowage areas under the load floor add extra capacity, while load rails help to secure contents in the luggage compartment. For even more space and flexibility, 60/40 folding rear seat squabs allow the luggage capacity to be expanded quickly and easily, with a substantial volume of 1445 litres available in the 5-Door with the rear seats folded. For added convenience, the Range Rover Smart Key system enables keyless entry to the vehicle. The rear tailgate is powered for ease of opening, and can also be opened remotely using the key fob. Customers can personalise their new Range Rover Evoque with a tempting array of design, trim and technology options, so that each car meets its customer's own taste and lifestyle. Gerry McGovern said: "Customers buying a premium vehicle expect to be able to tailor their new purchase. The new Range Rover Evoque gives individuals lots of opportunity to personalise their car, from the contrast colour on the roof to the texture of the metal interior trim." Pure - combining the stunning concept-car exterior with a stylish, clean interior in neutral colours to highlight the pure, simple forms of the cabin architecture. Soft-touch, wrapped materials on the major surfaces contrast with the real-metal brushed aluminium trim. Prestige - ultimate Range Rover luxury, combining a bespoke exterior that includes unique, 19-inch wheels and sparkling metallic details with an indulgent interior that is almost entirely leather-wrapped. Luxurious duo-tone colour schemes are embellished by premium leather, twin-needle stitching and real wood and metal finishers. Dynamic - bold exterior with 20-inch wheels and unique bumpers, sills, grille and tailpipes for a more assertive, confident stance. Contrasting roof and spoiler colour is an option, while the premium sports interior offers a darker environment with splashes of bright contrast colour, together with perforated leather seats and unique sports detailing. Each of the immaculate designer interiors brings its own unique combination of colours, materials and finishers, tastefully co-ordinated down to the texture of the leather and the colour of the contrast stitching. Even these designer themes can be personalised by the customer, with a choice of textured metal patterns or real wood veneers on the distinctive interior finishers. The full range of choices embraces every aspect of the vehicle, giving unprecedented opportunities to customise each car. Owners can also choose from a very broad selection of official Range Rover accessories, most of which have been developed specifically for the Range Rover Evoque. The accessory range includes exterior and interior styling, together with a comprehensive choice of practical loading and towing items. Additional exterior styling items include bright side protection sill tubes, bodyside decals, coloured wheel centres, and alloy wheels in alternative finishes, such as black. Within the vehicle, customers can select features like metal sports pedals, illuminated aluminium and chrome tread plates, and footwell mats in a variety of different materials. To carry sports equipment or bicycles, there is a range of roof-mounted stowage systems and carriers. There is also a full towing kit, together with tow hitch mounted bicycle carriers. Versatile luggage stowage systems are made possible with the addition of loadspace stowage rails. A strap with an Inertia locking reel, which works in a similar way to a seat belt, is one feature which prevents movement of items in the luggage area. The rails can also support a 'Social Seat'. For years, Range Rover owners have sat on the edge of their tailgate to socialise at outdoor events. Land Rover has taken note and customers can now fold out a seat which acts like an open lower tailgate, providing comfortable seating for two . Coupled with the powered tailgate, the 'Social Seat' offers additional flexibility and convenience. The all-new Range Rover Evoque has been designed and engineered to provide drivers with a finely judged balance of sporting driving dynamics, responsive performance and sophisticated refinement. This polished driving experience is true to the values of the Range Rover brand, but adds a more dynamic and sporting character which is consistent with the exciting promise of the Evoque's bold, concept car design. David Mitchell, chief programme engineer, explained: "Market research indicates that the more youthful target customers for this car favour a more sporting driving character. This has encouraged us to deliver driving dynamics with a more engaging and connected feel, without losing the poise and refinement which is an important characteristic of the Range Rover brand." Achieving the desired dynamic character in the Evoque required an evolution of the Range Rover DNA. Starting with the driving dynamics of the Range Rover Sport, which has a similar DNA to a luxury sports saloon, Range Rover dynamics specialists set out to deliver a more agile and connected drive. Particular objectives were to increase steering precision and agility at lower speeds, so that the car was more responsive and fun-to-drive in typical urban driving conditions. While the Range Rover Evoque's lighter weight, more compact footprint and lower centre of gravity helped to achieve a more agile character, key engineering changes were required to deliver the required responses. Range Rover engineers initially focused on optimising the stiffness of the chassis systems and body structure, followed by meticulous tuning of the suspension components and electric power assisted steering (EPAS) system. Starting with the fully independent suspension - featuring long-travel coil-sprung struts front and rear - revised rear suspension geometry was adopted to raise the rear roll centre. Although these changes delivered greater agility, the Range Rover Evoque has handling responses which remain flattering and predictable, without any nervous reactions. To make sure the Evoque retained the poise and stability which is typical of long-travel Range Rover suspension systems, engineers tuned the car to retain the same comfortable yet connected ride of the Range Rover Sport, with excellent control of body motions and low levels of body roll. This meticulous tuning of suspension bushes and spring and damper rates has ensured the Range Rover Evoque's more sporting character has not compromised comfort and refinement. Range Rover Evoque customers have the opportunity to specify a state-of-the-art new Adaptive Dynamics feature which uses advanced MagneRide™ continuously variable dampers. With the MagneRide dampers - which are more typically fitted to high performance sports cars - the Adaptive Dynamics system provides an optimum balance between confident, nimble handling and a supple, well-controlled ride. MagneRide™ dampers offer infinitely variable damper settings between soft (comfort) and hard (sports) extremes, and operate by using a special damping fluid which contains magnetic particles. When subjected to a magnetic field, the fluid becomes more viscous, thus increasing the damping. This technology allows MagneRide™ to change damper settings quickly and with a wide operating range, delivering more stable and confident dynamics. The Adaptive Dynamics system monitors vehicle movements at least 1000 times/second*, reacting to driver or road inputs virtually instantaneously to give greater control and minimise body roll, providing a balanced, flat ride. The system will even sense off-road conditions, and optimise damping accordingly. Drivers can also select a Dynamic Mode via the Terrain ResponseTM system, which modifies the damper settings to deliver even tighter body control, with flatter handling and sharper responses. Like a true Range Rover, the four-wheel-drive Evoque delivers the all-weather, all-surface capability which is a hallmark of the brand. In common with its larger siblings, the new model provides formidable off-road potential, which is enhanced by the company's signature Terrain ResponseTM system. The standard four-wheel-drive transmission is an innovative full-time intelligent system which continuously varies the front/rear torque split using an electronically-controlled Haldex centre coupling to deliver optimum grip and balance for the current driving conditions. The Haldex coupling has been specially calibrated to suit the Range Rover Evoque's nimble and responsive dynamic character, and to ensure it delivers a fun-to-drive experience at all speeds. For customers who do not require Range Rover's legendary all-terrain capability, a front-wheel-drive model is available which delivers even better fuel consumption. The front-wheel-drive system has been carefully optimised to offer the same agile and fun-to-drive handling as the four-wheel-drive model. The Range Rover Evoque has an all-turbocharged engine line-up with a choice of state-of-the-art petrol and diesel power units. Both petrol and diesel powertrains are impressively refined, delivering strong, torquey performance with ample power in reserve. These advanced engines are hushed and relaxed when cruising at speed, but are tuned to deliver an enjoyable, sporty note during more spirited driving. The engines are twinned with sophisticated and efficient six-speed transmissions - automatic only for the petrol engine, and automatic or manual for the diesel. Petrol models feature the new downsized 240PS 2.0-litre Si4 engine. This state-of-the-art petrol engine offers smooth and responsive power, delivering 0-60 mph in 7.1 seconds*, blending four-cylinder efficiency with six-cylinder performance. The latest powertrain technologies - including advanced turbocharging, high-pressure direct fuel-injection and twin variable valve timing - are combined to provide outstanding driveability, with very strong bottom-end performance and an extremely broad, torquey power band. The Si4's highly efficient combustion system enables it to achieve significant reductions in fuel consumption and CO2 emissions: the downsized 2.0-litre unit cuts CO2 emissions by up to 20 per cent* compared to traditional larger capacity petrol engines of the same power. The compact all-aluminium four-cylinder engine is also substantially lighter than conventional engines with a similar output. For example, the 240PS 2.0-litre Si4 unit weighs around 40kg* less than Land Rover's 233PS 3.2-litre i6 engine. Other key engine technologies include a Mahle sound generator for a rich, powerful engine note during strong acceleration, a unique fabricated sheet metal exhaust manifold (for quicker warm-up and lower emissions), optimised low-friction design with special treatments for the piston rings and tappets, and a state-of-the-art electronic management system. Twin balancer shafts and an optimised all-alloy engine construction ensure superior refinement with smooth, sophisticated performance. Diesel Range Rover Evoque models feature the latest 2.2-litre turbodiesel, available in 190PS (SD4), 150PS (TD4) and high-economy 150PS (eD4) derivatives, which delivers an excellent balance of strong, high-torque performance, impressive refinement and outstanding fuel economy. The 2.2 turbodiesel range has been comprehensively updated to provide significantly more power, a very broad torque curve, further reduced noise levels and lower CO2 emissions. Over 60 per cent* of components are either all-new or significantly modified. The sophisticated power unit engine features high-pressure common-rail fuel injection with piezoelectric injectors, a variable nozzle turbine (VNT) turbocharger, a variable swirl system and an uprated engine management system for optimum combustion efficiency. Very low noise levels and impressive smoothness are achieved through technologies like a double-walled cylinder block and twin balancer shafts. Innovations introduced in the latest version include new low-noise injectors, a water cooled turbo for improved performance, reduced piston friction for optimised efficiency, new EGR system for lower particulates, lighter engine components, faster glow plug operation, and enhanced NVH measures. Cars with the M66 six-speed manual transmission feature a stop-start function to reduce fuel consumption and CO2 emissions by a further eight per cent*. For the ultimate in low carbon performance, Range Rover Evoque customers can specify a front-wheel-drive manual car with the high-economy eD4 variant of the engine, to deliver a class-leading sub 130g/km* CO2 (coupé bodystyle). Range Rover engineers have applied meticulous attention to detail to ensure that the Evoque displays a refined and harmonious sound quality under all driving conditions. Innovative technologies, including advanced computer simulations and painstaking optimisation using state-of-the-art analysis tools like sophisticated acoustic cameras, have been used to identify and remove all undesirable sounds. The advanced turbocharged petrol and diesel power units are both inherently quiet and smooth, but further careful optimisation of the engine installations has made it possible to reduce powertrain sound levels to best-in-class levels. All sources of unwanted noise have been isolated or eliminated, resulting in a refined sound quality across the full operating range. Wind noise has been minimised through analysis with computational fluid dynamics, and exhaustive wind tunnel tests. Key areas, such as the shape of the A-pillar and door mirrors, were optimised very early in the development process. A special acoustic windscreen lamination, as used on the larger Range Rovers, further reduces wind noise and also helps to eliminate high-frequency combustion noise. Road noise in the Range Rover Evoque has been comprehensively managed through the use of stiff, lightweight alloy suspension components, along with carefully optimised bushes. These features work in conjunction with extremely stiff suspension attachment points within the bodyshell and accurately applied sprayed insulation material, to further minimise NVH. All other operating sounds within the car, from door closing sounds to the noises made by switches and motors, have been analysed and refined during the development process to create a harmonious and premium sound quality for all occupants. David Mitchell said: "It was critical that the Range Rover Evoque met the same standards of refinement as the larger models in the line-up. When drivers experience the new model, they will recognise the characteristic Range Rover qualities of relaxed and effortless performance and the tranquil interior environment." The all-new Range Rover Evoque sends a powerful message that the company is serious about sustainability, and determined to deliver products which are both relevant and highly desirable. As a smaller, lighter and more efficient new Range Rover, the Evoque addresses the growing consumer need for more environmentally friendly vehicles. While the Evoque offers the premium levels of luxury and performance customers expect from a new Range Rover, it also demonstrates the kind of efficiency and responsible design that make it one of the most sustainable cars in its class. David Mitchell said: "The greener credentials of the Range Rover Evoque stem from a comprehensive approach to reducing its environmental impact, not just during customer use, but throughout the entire life-cycle of the car. This whole-life approach allows us consider the best ways of minimising the overall carbon footprint, taking account of development, manufacturing and end-of-life recycling, so that we can make the smartest, most sustainable decisions." The first step in creating a more sustainable Range Rover was to make it smaller. Following the lead of the LRX concept, the Range Rover Evoque is the smallest Range Rover ever, packing the same level of luxury and technology but shrink-wrapped into a much more compact and efficient footprint. Despite its imposing presence on the road, at 4,355mm long, the coupé is a massive 425mm shorter than the Range Rover Sport, and both models have a similar sized footprint to any typical medium saloon. With its dramatic sloping roofline, the coupé model also sits over 180mm lower than the Range Rover Sport, while the slightly taller 5-Door measures 150mm lower. A smaller vehicle is a more sustainable vehicle, and the compact size of the Range Rover Evoque has helped engineers minimise its weight, improve aerodynamic performance and reduce the quantity of materials required to produce it. The more efficient architecture also creates the opportunity to benefit from lightweight, downsized high-efficiency four-cylinder turbocharged petrol and diesel engines, leading not only to superior performance, but also to minimised fuel consumption and CO2 emissions. It is worth noting that the compact footprint of the Range Rover Evoque has not been achieved at the expense of traditional Range Rover virtues. The car retains generous interior legroom and headroom, a very practical trunk, plus highly capable off-road geometry and ground clearance. Weight saving was a primary objective in the development of the Range Rover Evoque, and engineers have applied a range of advanced lightweight materials to make this the lightest Range Rover ever, with weights starting at just 1600kg*. Reducing weight creates a virtuous circle, as lighter weight in one area of the car makes it possible to introduce lighter components in another, and so on. As the overall weight drops, performance improves and both fuel consumption and CO2 emissions can be significantly reduced. Smaller weight savings have been achieved by smart engineering decisions in all areas of the car, ranging from a thinner windscreen with acoustic lamination and lighter weight alloy wheels, to lightweight laser-welded seat structures and optimised sprayed insulation materials. Petrol cars benefit from the introduction of the all-new lightweight, 240PS 2.0-litre Si4 engine, which weighs around 40kg* less than Land Rover's i6 engine with a similar power output. For the ultimate in weight saving, the front-wheel-drive Range Rover Evoque is 75kg* lighter than the four-wheel-drive version, and delivers superior fuel economy and CO2 emissions for customers who do not require four-wheel-drive all-terrain capability. The state-of-the-art petrol and diesel engines featured in the Range Rover Evoque have been completely optimised using the latest powertrain technology to deliver outstanding fuel efficiency and minimised CO2 emissions. The all-new lightweight, downsized 2.0-litre Si4 petrol engine employs the latest generation of high pressure direct-injection technology, together with low-inertia turbocharging and twin independent variable valve timing, to create an exceptionally efficient combustion system. Compared to conventional larger capacity engines with a similar power output, the new Si4 engine can reduce CO2 emissions by up to 20 per cent*. For diesel customers, the latest TD4 turbodiesel engine has been comprehensively updated to achieve reduced fuel consumption and CO2 emissions, with 60 per cent* of components either all-new or significantly modified. The new TD4 features high-pressure common-rail fuel injection with piezoelectric injectors, a variable nozzle turbocharger, a variable swirl system and an uprated engine management system for optimum combustion efficiency. The high economy 150PS eD4 version has a completely recalibrated fuel injection system with reduced fuel flow rates for enhanced fuel efficiency. On diesel cars with a manual transmission, the Evoque becomes the first Range Rover to offer a stop-start function, which reduces fuel consumption and CO2 emissions by a further eight per cent*. Automatic models benefit from the latest generation AW F-21 six speed transmission, which has been extensively revised to improve its operational efficiency, including gear train optimisation, advanced idle control, and the adoption of low viscosity transmission fluid. Range Rover engineers have rigorously eliminated parasitic losses from every area of the Evoque, to ensure that the car delivers the lowest possible fuel consumption. The Evoque breaks new ground by being the first Range Rover to offer the option of front-wheel-drive for customers who do not require the brand's legendary all-terrain capability, but who wish to minimise their carbon footprint through further reduced fuel consumption and CO2 emissions. The availability of front-wheel-drive reinforces the green credentials of the Range Rover Evoque, and highlights the enhanced efficiency and responsible design that make it one of the most sustainable cars in its class. Contributing an additional weight reduction of 75kg* and improving the overall driveline efficiency, the front-wheel-drive version enables the Range Rover Evoque coupé to achieve class-leading CO2 emissions of sub 130g/km*. The front-wheel-drive sub 130g/km* model features the high-economy eD4 150PS diesel engine, and provides diesel customers with a convincing alternative to hybrid competitors. As part of the comprehensive effort to minimise the car's ecological impact, the Range Rover Evoque has been designed to maximise the use of more sustainable materials. Recycled materials have been used wherever possible. Each car uses 16kg* of recycled plastic material, diverting over 1,100* tonnes of plastic from landfill during the car's lifetime. Parts with recycled content include: headliner, seat covers, centre console, wheel arch liners, air cleaner, cooling fan and shroud, air ducting, side under trays, parcel shelf, engine cover and subwoofer box. High quality natural and renewable materials, such as leather, cotton, cardboard and rubber, are used extensively, amounting to 21kg* of material in every vehicle. Key examples include the generous quantities of leather used on the seats, instrument panel and door casings, and natural materials used in the carpets and body insulation. High quality Morzine trim fabric used on the headlining and pillars is entirely produced from recycled polyester sourced from recycled bottles and fibres. Using recycled material for this fabric results in a 66 per cent* lower energy demand and 54 per cent* lower carbon footprint during production. Authentic metal interior finishers used on all models on the centre console and the fascia strip are produced from 95%* recycled aluminium, significantly reducing the energy requirement in production. The all-new Range Rover Evoque has been designed and engineered to provide customers with the same comprehensive range of premium technologies they expect from a true Range Rover, just shrink-wrapped into a more compact package. To maximise control, comfort and enjoyment on board for the driver and passengers, the Range Rover Evoque is packed with a host of desirable and intuitive technologies which are normally associated with much larger, more expensive models. The unrivalled array of premium Range Rover equipment comprises the latest technologies for controls, connectivity, comfort and convenience, including some highly distinctive and original signature features plus stunning new high-end Meridian audio systems. David Mitchell said: "The Evoque provides the complete Range Rover experience, but packaged into a smaller, more attainable car. Many of the new customers will be more youthful, tech-savvy buyers, whose expectations will be exceeded with the rich array of premium features that will make ownership a real pleasure." From the driving wheel, the Range Rover Evoque is distinguished by a carefully conceived system of controls and displays which combines a stylish, uncluttered layout, state-of-the-art functionality and class-leading ease-of-use. At the heart of the control system is Range Rover's much acclaimed 8-inch high-definition touch-screen display with its crisp, elegant graphics and simple, highly intuitive menu structure. The large 8-inch touch-screen provides the primary control and display system for a wide range of features including audio, video, navigation and phone. The screen graphics have been precisely honed, giving the impression of three-dimensional buttons, beautifully lit with subtle chrome detailing. With fewer rows of information, the latest generation of the display has been designed for improved usability with bigger buttons and greater separation. Simple hard keys on either side of the display provide convenient short-cuts to the most commonly used screens, such as Home, Audio/Video, Nav and Phone. The 8-inch display can also be specified with the innovative Dual View technology. This enables the driver and front passenger to view completely independent content, so that, for example, the passenger can watch a DVD while the driver follows route navigation instructions. Complementing the touch-screen, a full colour 5-inch display between the two instrument dials presents the primary vehicle-related information, such as temperature and fuel levels, gear position, Terrain ResponseTM mode, and cruise control/hill descent information. Other highly intuitive controls include the simplified HVAC dials, twin five-way toggle switches on the steering wheel, and a highly sophisticated voice control system which provides 'Say What You See' prompts in the cluster display to help the driver input the required commands. Hands-free mobile phone use is enabled by Bluetooth connectivity, which allows a compatible handset to communicate with the car's in-built phone system. The phone can be controlled via the 8-inch touch-screen or the steering wheel controls, and the system automatically downloads the latest phonebook contacts, so that making a call is simple and safe. The Range Rover Evoque also supports Bluetooth audio streaming, so that customers can enjoy music stored on their phone, or other portable Bluetooth device, via the car's audio system. Essential connectivity for iPods and other portable MP3 players or memory sticks is provided by a comprehensive range of inputs including a direct iPod connection, USB sockets and an auxiliary input. The primary iPod functions can be easily controlled through the 8-inch touch-screen display. To complement the groundbreaking style of the exterior, Range Rover designers and engineers have made sure the Evoque has a host of other distinctive technologies which bring an added dash of cool to the ownership experience. The Range Rover Evoque is available with xenon headlamps where first to catch the eye is the powerful signature graphic in the front running lights, created by innovative LED light-blade technology. A similar graphic is repeated in the stunning LED rear lights, with their jewel-like three dimensional petal design. Approach the car at night, and you will also see a bold Range Rover graphic alongside the front doors, illuminated by the 'puddle lights' which shine from the mirrors. More special touches greet you when you enter the car. The interior displays and ambient lighting come to life with a precisely-choreographed animated start-up sequence, featuring a series of sophisticated graphics. On automatic cars, the stylish solid aluminium rotary shifter completes the 'greeting' as it rises silently into the driver's hand. LED ambient lighting provides subtle and precise illumination within the cabin, with a range of colours which can be chosen by the driver to suit their mood. Select Dynamic mode, however, and a sporting red colour scheme fills the interior as well as in the instrument dials and cluster display. To complete the range of sensations, the first panoramic roof ever fitted to a Range Rover can be specified, providing an all-round vista which helps to make every journey a special occasion. For the audiophile, the Evoque is the first Range Rover to offer breathtaking new sound systems developed in partnership with the specialists Meridian, a world leader in audio technologies and digital sound processing. 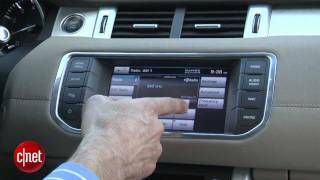 This level of Meridian audio technology is exclusive to the next generation of Range Rovers, and promises sound quality which equals the company's high-end home systems. 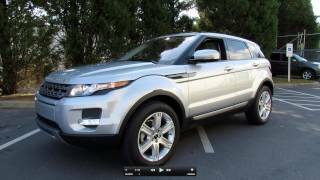 The Range Rover Evoque is available with two high end Meridian sound systems. A powerful 380W 11-speaker arrangement is offered as standard, while a top of the range 825W 17-speaker system with full surround sound comes as an option. Both offer super sharp, crystal clear sound quality and their peak power outputs are based on the 0.2 percent Total Harmonic Distortion with Noise (THD+N) rating. State-of-the-art amplifiers incorporate Meridian's latest digital processing technology to ensure perfectly optimised sound quality, while both systems feature branded Meridian high-efficiency speakers with lightweight neodynium rare earth magnets for exceptional clarity and dynamics. Range Rover and Meridian audio specialists have also applied the sophisticated Meridian Trifield surround staging technology, along with Dolby Pro Logic IIx and DTS Neo:6; finally Audyssey MultEQ XT audio tuning system, which digitally corrects any imperfections created by the cabin environment to deliver accurate, enveloping, and distortion-free sound for all seating positions. To complete the entertainment options, the Range Rover Evoque is also available with Digital and Satellite TV, DVD playback capability, a hard drive virtual 10 CD multiplayer, and DAB/FM/AM/Sirius tuners with a high performance twin antennae system. For rear seat passengers, there is a comprehensive entertainment package which features full 8-inch video screens in the front headrests, a dedicated touch-screen remote control, and state-of-the-art digital infrared wireless headphones which provide stunning DVD-level sound quality. The Range Rover Evoque is equipped with the latest generation of smart driver assistance technologies to help make life behind the wheel as safe and stress-free as possible in today's congested driving conditions. Park Assist - Applied for the first time in a Range Rover, this automated technology helps drivers parallel park their car in tight urban parking spots. The Range Rover Evoque has a latest generation system which can park in a very short space (just 1.2 times the length of the car); when required, the system allows the driver to shuffle backwards and forwards to achieve an optimum parking position. Once the system has identified a park space using its ultrasonic sensors, the system automatically steers the car into place while the driver operates the accelerator, brake and clutch. Informative graphics and messages are displayed in the cluster screen, to guide the driver through each stage of the manoeuvre. Blind Spot Monitoring - The system alerts the driver when a vehicle enters it hidden blind-spot zones on either side of the vehicle. Two sophisticated radar sensors mounted in the rear bumper monitor both sides of the car, and the system illuminates a warning light in the corresponding wing mirror when a vehicle enters a blind spot zone. The system is optimised to work at the lower speeds commonly encountered in urban conditions or on congested motorways.